I had to go to Romania with work the last week. 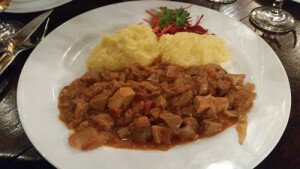 When I think of Eastern European cuisine I (used to) think of rich meaty stews and hunks of flesh served with cabbage. However, I was pleased to learn that wasn’t necessarily the case in Bucharest. 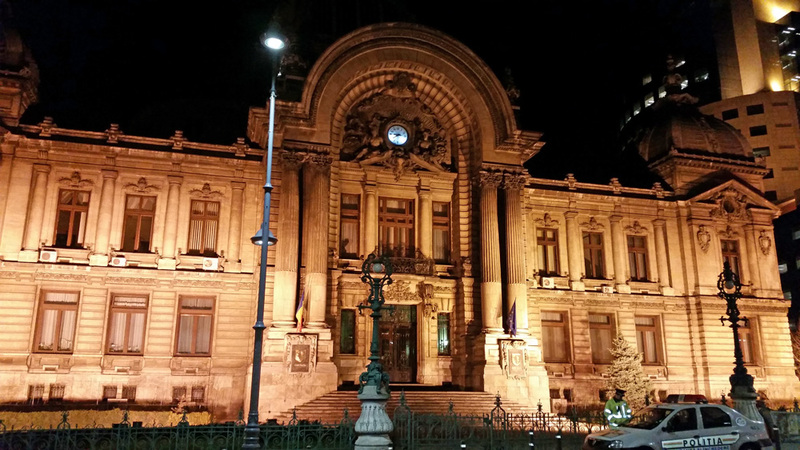 A fact I didn’t know – around 87% of the Romanian population are Orthodox Christians. What is the relevance of this? There are times of the year where Orthodox Christians undergo a strict fasting period which basically means they follow a vegan diet! (More information here). So although I found that most restaurants didn’t understand the term “vegan”, they knew exactly what I meant if I mentioned fasting! And in some cases there was even an extra menu dedicated to this. Not everyone in Romania is oblivious to veganism however. Whilst I was there I visited one vegetarian restaurant called Barca which had a very extensive menu, entirely vegan apart from the occasional guest-appearance from honey. 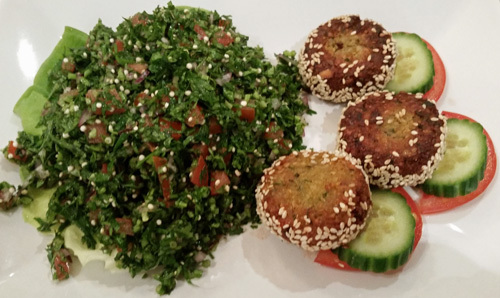 I had falafel with a chopped parsley salad and it was very tasty and light. 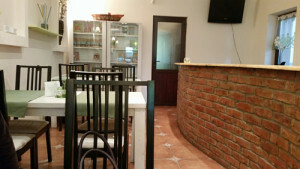 The restaurant itself was also very clean and fresh-faced. I wish more UK vegan joints were like this! I also ordered takeout from a place called Biofresh. 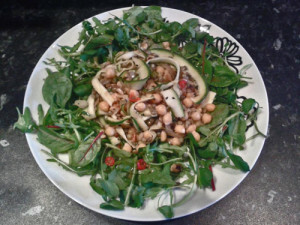 I had a salad consisting of courgette, tofu, dill, wheat germ and garlic with a dressing made from tofu, basil, pine nuts, olive oil and spices. It sounds like such a simple meal but it was so delicious I was inspired to make my own variation when I got home (recipe below!). It was just a shame that nearly all of the desserts from these places contained honey (miere). 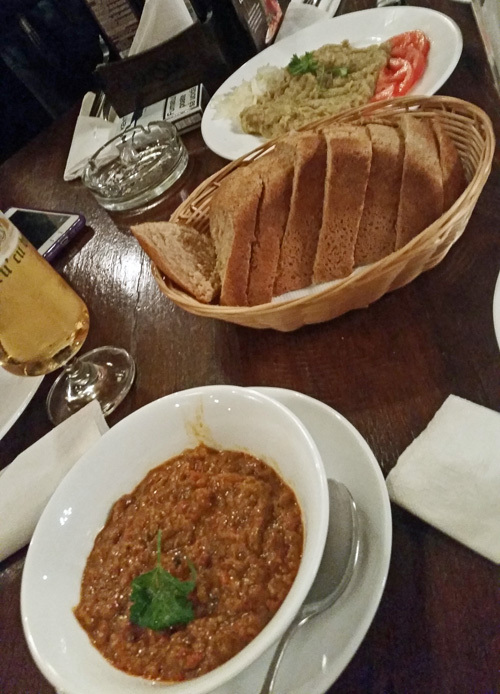 A non-veggie place I visited was a restaurant called “Caru’ cu Bere” (or “The Beer Wagon” in English). 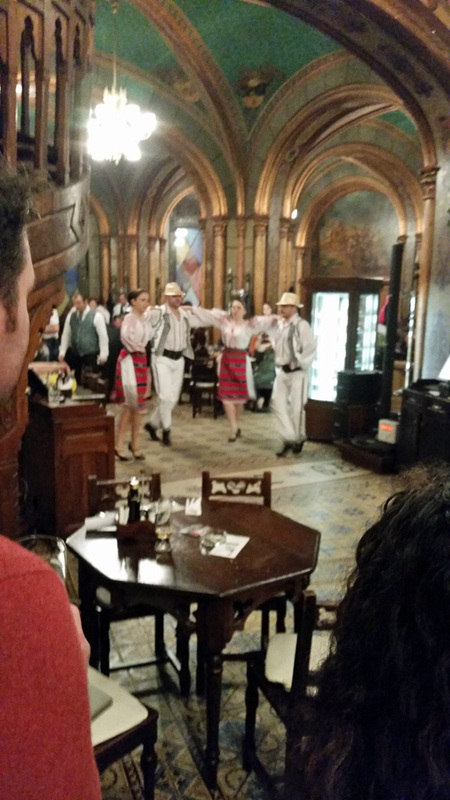 This place is one of the oldest beer houses in Bucharest and although it was a bit of a carnivore’s paradise, it was amazing! 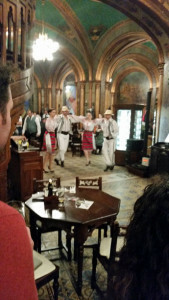 There were traditional dancers performing at regular intervals and it was heaving with people, even on a Wednesday night. I shared a loaf of bread with an aubergine dip and a traditional dip made from a variety of vegetables for starter, followed by a traditional vegetable stew with polenta for my main course. Both were hearty and delicious! 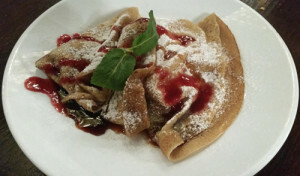 I didn’t really have room for a pudding but then I got passed the “fasting menu” and discovered that they had egg and dairy free pancakes!!! Nom! This recipe is super easy if you have a food processor with a grating function. If not, you’re going to need strong arm muscles and a cheese grater as you need to grate all of the carrot and courgette before putting into a large bowl. Next, chop up the dill and mix into the courgette and carrot. 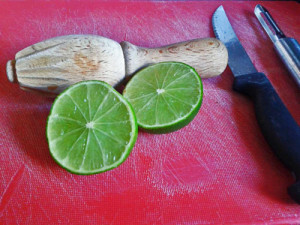 Pour the freshly squeezed lemon juice over the veg whilst stirring. You can add black pepper to taste. ½ x cup soya milk (or any dairy replacement). Put the tofu, pesto, salt, pepper, garlic powder and milk into a blender. Blend until smooth. The sauce will taste a bit “beany “so next step is to transfer into a small saucepan and heat whilst stirring (a silicon spatula is perfect for this). Once the dressing begins to bubble*, take off the heat and add the nutritional yeast. You will have to stir fairly vigorously to make sure its mixed in well with no lumps. *Please take care because the sauce has a tendency to spit! Allow to cool and serve over your salad. 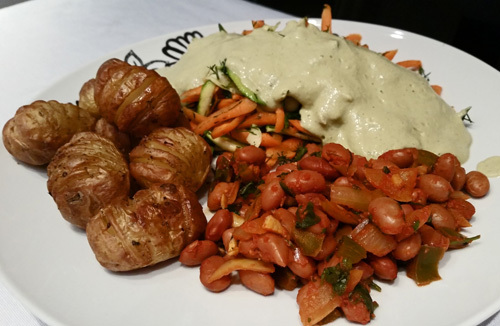 I combined my salad and dressing with some roasted baby hasselback potatoes and some chili and coriander beans. 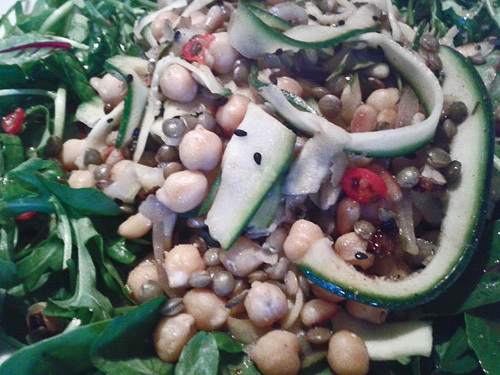 Satisfying, healthy, cruelty free and importantly, delicious! 43. 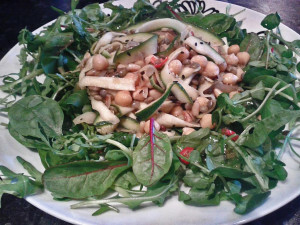 Courgette and chickpea salad with a chilli and lime dressing. Ever since I have eaten solid food, I have professed to hating courgette. Only a few days ago I was moaning on Facebook about how much I hate that unimaginative restaurants always serve courgette as the veg*n option. In fact, I was away with the hubby (celebrating our 1st wedding anniversary!) when I nearly cried in a restaurant when I found out that the vegan option for the main course was a courgette salad. So… imagine my surprise when I “forced” myself to eat said salad, only to find that I really really enjoyed it?! So much so that I actually went and bought a courgette when I got home and made the below delightful salad with a super delish dressing. Recipe as follows! Mix all ingredients together in a jug and leave to one side. 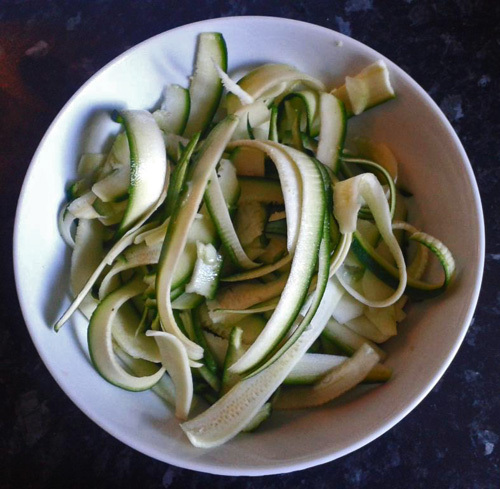 Place the courgette ribbons in a bowl and pour over the lemon juice. Set to one side. In a lightly oiled pan, gently heat the onion, garlic and pine nuts. You want the pine nuts to turn a golden brown without the garlic burning. Add the black sesame seeds and chickpeas and continue cooking until the chickpeas are heated through. Add the courgette and juice to the pan and toss until the contents of the pan is well mixed. Add the lentils and heat until they are heated through. On a plate, arrange a bed of the mixed leaves. In the centre, place half of the chickpea-courgette mixture. Drizzle on as much of the dressing as preferred. If using, sprinkle some nutritional yeast over the top. I still can’t believe how after all these years I have managed to change my opinion of these little green wonders! Definitely a great recipe for anyone who is as unsure about courgette as I am.